The real (Donal_Blaney) and fake (Blaneysblarney) twitter pages. How to Make Money on Twitter: Do Commercials! British members of Parliament and their prospective challengers are thronging onto social-networking sites with all the enthusiasm and grace of dads getting down on the dance floor. Their aim: to capture the elusive  and largely uninterested  youth vote when the country goes to the polls sometime before June 2010. With 79 of Britain's 645 MPs currently using Twitter alongside almost 200 prospective parliamentary candidates and a raft of Westminster journalists and bloggers, digital politics has become as crowded and combustible as the analogue version. 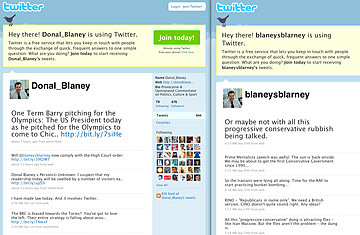 The latest conflagration  a battle between Conservative blogger Donal Blaney and a Twitter imposter tweeting as @blaneysblarney, the name of Blaney's blog (http://donalblaney.blogspot.com/)  looks set not only to make legal history but also possibly to impact on the use of Twitter worldwide. At 6:30 p.m. on Oct. 1, in response to a petition filed by Blaney, the English High Court sent this "direct message" to @blaneysblarney via Twitter: "You are hereby ordered by the High Court of Justice to read and comply with the following order." This was accompanied by a link to a web page containing the command to desist from the misleading tweeting. By clicking the link, the miscreant risks revealing his or her personal IP address, but Blaney realizes his shadowy opponent might not fall into this cunning trap. "I've watched enough [of the police TV drama] NCIS and all these kinds of programs to see links bouncing around the world and it ends up being in a hut in Guatemala rather than where it really is, which is probably in someone's bedroom in Islington," says Blaney. The London borough of Islington, former home of Tony Blair, is a byword for leftwing politics and Blaney believes his phony alter-ego will prove to be "one of half a dozen leftist bloggers who hate my guts." An attorney by trade, he's not a little chuffed at achieving the legal first of having an injunction delivered by Twitter. @blaneysblarney tweets things like this: "Now Obama, who the eurofederasts love, is happy to leave us to the mercy of the mad mullahs." The real Blaney just blogged on Obama, suggesting the President might have done better in pitching for the Chicago Olympics "to play up his Kenyan heritage (and, as some allege, the country of his birth)." Blaney says that it's precisely because the impostor is doing a good job of imitating him that he decided to act. "If it was a parody, if it had been set up saying 'I'm bored today; let's go and invade France,' I wouldn't have got the order. As right wing as I am, I wouldn't advocate invading France today. Maybe next month, but not today." Why bother to go to the expense and effort of court when Twitter has its own procedures for dealing with impostors? The answer is twofold. Blaney first encountered the problem of fake Twitter accounts when he represented a client who was attempting to have just such an account shut down. He complains that Twitter took more than a week to suspend the fake account. "You can't phone Twitter," he says. "As an aggressive litigator I was sending lots of nasty, threatening letters making clear what would happen to Twitter's metaphorical gonads if they didn't behave. Those were ignored. It's the first time in my life that's ever happened." But Blaney's high-profile action also highlights the increasing dangers of identity misappropriation as Twitter and other social-networking sites become staple tools of political campaigning. Kerry McCarthy, an MP appointed by Labour as the party's "Twitter czar," has already intervened to stop two well-meaning Labour supporters from tweeting as other people in a misguided effort to boost the party (one posed as an MP, the other as an official Labour outlet). @lordmandelson, a fake version of Business Secretary Lord Mandelson, has also suspended activities. The Foreign Secretary, David Miliband, who now tweets as @DMiliband, was beaten in the race to join Twitter by an impostor whose elegiac tweet on Michael Jackson's death was widely quoted by credulous media. "So far it's all been quite amusing," says McCarthy. "David Miliband talking about Michael Jackson's death isn't going to cause a foreign policy crisis whereas David Miliband saying, 'It's all the fault of the Jews,' could bring about World War III." "The media should handle a comment on Twitter in the same way as they do any other public source and comment: they need to verify accuracy before reporting," says Alberto Nardelli, one of the founders of Tweetminster (http://tweetminster.co.uk/ and @tweetminster), which aggregates the feeds of British politicians and commentators, and verifies politicians' identities before including their tweets. As yet there's been no response from @blaneysblarney to the injunction. The real Blaney is already planning his next moves  to try to persuade a British judge to serve a penal notice via Twitter, a more serious move that could result in the jailing of the impostor. He may also file a suit against Twitter. "My aim is to get this taken down, ideally to identify the individual behind it and to set the precedent," says Blaney. His action may indeed give pause to pranksters. But with more and more politicians taking to tweeting, it remains to be seen whether they or their impostors are capable of inflicting worse damage to their reputations. Follow Catherine Mayer on Twitter.